Halina Birenbaum: "If the World Could Be Thus"
For several weeks our mass media in Israel an-nounced the Pope's visit. This exceptional event was commented on from every viewpoint, from simple expectations to absurd guesses. Discussions and argu-ments held sway incessantly: the principles of the Catholic faith, the meaning for Christians of the Holy Places in our ancestral land, where Jeshua (Jesus), the founder of the Christian religion, was born. Abruptly, the realities of our daily life - our political and religious strife, our accumulated problems, our incessant struggles, our bloody encounters - take on another dimension. The words "the Pope" dominate all ordinary daily events. The Pope in Jerusalem, in Israel! He comes to us! A crowd is at the airport: the ministers, the elite, the President with his spouse, the Prime Minister of Israel with his spouse, the President of the Knesset, thousands of pilgrims from all over the world, the flags of many countries, even of those with which, up to now, we have not had peaceful relations. Universal emotion, the wait for the arrival of His Holiness from his pilgrimage to Egypt and Jordan in the footsteps of our biblical ancestors. The red carpet, the flags of the Vatican and of Israel. The airplane from Jordan with Jordanian and Israeli flags breaks through the clouds. It lands at Tel Aviv! The door of the plane opens. The white, slightly in-clined figure of the Pope, humble, surrounded by cardi-nals, is silhouetted against the background of the as-sembled crowd. He is the guest of the Jewish nation, of the Jewish state - of Jews, Muslims and of Christians. He alights with a slow, decided step, leaning on the rail. In his measured, prudent walk, one senses that he knows where he is going and what important goal leads him. He lifts his head, stops suddenly; his glance em-braces the people assembled in his honor. With a slight movement of his hand and a certain timidity, he greets them warmly, modestly accepting the applause directed to him. The seriousness and the joy of this historic moment filters, by means of television, into almost all the homes and hearts in our country and in the world. It is profoundly moving. The Pope here, with us, in our little country, always in upheaval! From this moment, and during the whole week of his stay in Israel, the eyes of the entire world will be fixed on our country. I experience all this as something which concerns me personally. I felt about the same a year ago, when the Pope was solemnly received at Gdansk. Sitting in front of the television, sensing those sublimate moments, I had the impression at the time, that I was there, surrounded by my friends, as if the geographical distance between Poland and Israel had disappeared. However, this time it is so much more! Now this is happening here, in our country! Now it is our turn. The eyes and the thoughts of my Polish friends are turned toward this distant country where now my home and my new family are, after the loss of almost all my relatives in the Shoah! The Pope who pays us this honorable visit is a son of the country where I was born, I and my grandparents, my parents, my brothers. His mother tongue is also my own. Each one of his words, each of his gestures, has particular meaning for me. His visit is extremely impor-tant for my whole country, in the light of our past, our present and our future! The desire of several centuries for a good understanding between Jews and Christians - will that hope finally be realized? My glance is fixed on his silhouette. I observe attentively all the reactions to his well thought out, meaningful words. I listen joyfully to the commentaries and appreciation of the chief Rabbi and others, espe-cially important personalities in Israel. Almost all of them admit that the present Pope is the greatest friend of Jews of all time. He expresses himself in the way and in the place where he should and even goes beyond. A Pope like this one is the first in history; no one else has ever done so much for good relations between the Jewish people and Christianity, to reestablish justice for Jewish people as Pope John Paul II has done. Friends and acquaintances call me to share their admiration for "this magnificent man" as they say. Everyone praises the calm, the order, the beauty of the choral hymns sung by the pilgrims and the religious from different countries. They admire the common enthusiasm and love for the Pope, the devotion of the pilgrims and the faithful who had to overcome multiple difficulties, economize penny by penny to be able to come from the remotest ends of the earth to participate in this pilgrimage. And the Pope, at what cost to him-self, physically and morally, is each step he takes in this holy but dangerous land? One hundred thousand persons await his arrival under rainy skies at Korazin on Lake Kineret (the Sea of Galilee). He appears, sur-rounded by cardinals and other ecclesiastics, under an open tent where he will celebrate Mass. Enchanted, I listen to chorales, to the unanimous acclaim of this immense, multicolored crowd: "John Paul Two, We love you!"... And within me a persistent voice repeats: "If only the world could be so! If it could be like this!" Simple, full of understanding, of love, in spite of all the differences among human beings. The Pope's face expresses the depth of his sorrow as he places a wreath. He bends silently over these terrible names, wipes his face with his hands with unspeakable sadness. He has tears in his eyes. I can see clearly his face, his eyes. In a miraculous way, I am there right next to him, at his side. Because, in reality, I carry within myself the nightmarish vision of those names and of the word Shoah! My childhood was in the Ghetto of Warsaw and of Auschwitz. The gas chamber at Majdanek, where I spent a whole night waiting for my death, relates to my gratitude for the supreme values of life, even in the depths of hell. Through a miracle, they didn't have enough gas that night, so the next morning the doors opened so that the job could be finished at Auschwitz. Nevertheless, I was undoubtedly destined to survive, then to live long enough to see the creation of the Jewish state, and to see this visit of the Pope, my great compatriot. Over the course of two thousand years, it is a visit unique in its expression and meaning. ...As a Jewish child unable to do the work of a slave in the concentration camp, I should have died, condemned to instant death. In a little poem, I recently wrote the history of my family reflected in the places engraved on the black stone in the soil of Ohel Yizkor, ... 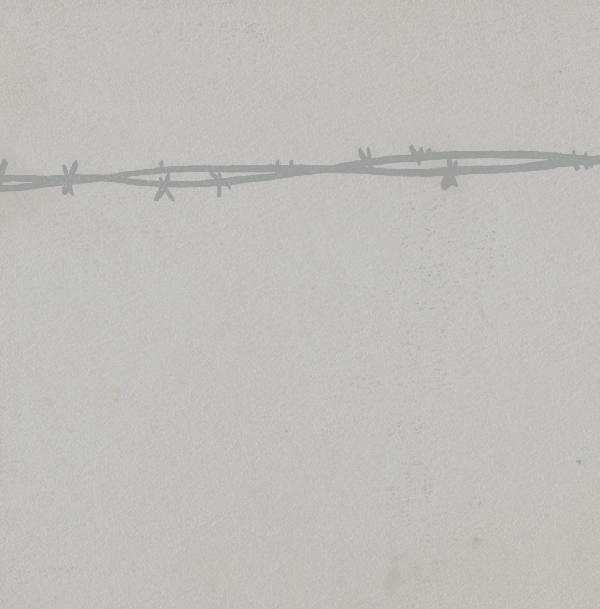 If I had died at Majdanek, I would be with the ashes of my Mother / If I had died in Treblinka, I would be with the ashes of my Father / If it was Auschwitz, with the ashes of my brother and my sister-in-law / If I had died there / death would not have been terrible for me." Many miracles have contributed to keep me from being ashes there, with my relatives, my parents, my neighbors, my childhood peers from the Warsaw ghetto, those with whom I dreamed of the end of the war, of the end of the occupation, of freedom from the claws of this terrible evil, to be a person not forbidden to live. Free! And today, the words and the tears of the Pope, full of imposing historic weight at Yad Vashem! What satisfaction after years of suffering and ineffable trage. Tears flow also on my cheeks. As if tin the Pope's eyes were mine, and mine, those years past, never shed, were his. Tears of sorrow, of lived torments, of the loss ofmy relatives, mixed with for this profounand compassion of the Pope. Gratitude, too, because he spoke forcefully here to God and exclusively to my nation and to persons like myself. At Yad Vashem he spoke to his faithful and to all the peoples of the world; he spoke of the prejudice Christians used against us over the centuries. At this time I want to share the outpouring of my affection with my friends from Poland. I know that at this same instant they are following this historic visit of the Pope. Their thoughts certainly are of me and they also must be tearful as they remember Yad Vashem. How can I communicate my thoughts and feelings to them? Is it at all possible? The next day, after a magnificent Mass at Nazareth - the Pope at the Wailing Wall... 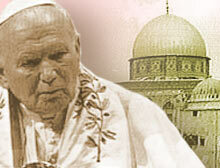 Under the clear sky of Jerusalem, vested in white, he is seated in an armchair on a blue carpet, surrounded by blue and white flags emblazoned with the Star of David... On the television screen, as during the whole time of the Pope's pilgrimage in the Holy Land, subtitles in Hebrew inform us: Alija l'Regel (pilgrimage), and an image of the Cross is in the place of the letter "'". Everything according to mutual respect for traditions, even to the smallest details. Once again, a voice cries out within me: "If only the world could be like this every day!" The Arab politicians and the representatives of various religions, some of our ministers, the chief Rabbi and a member of the Knesset welcome the Pope with cordial expressions of respect, consideration and admiration. His modest and humble attitude and his paternal affection inspires in everyone a benevolence that we rarely feel. The emotion is great as he approaches, alone; the ancient wall, Bet Hamikdasz, the Wailing Wall, in the crevices of which people have the custom of putting small papers with prayers and ardent supplications addressed to God. Surrounding him, almost a void, silence. And this silence is pregnant, a silence that we have not had here for two thousand years. The Pope whispers a prayer, touches the Wall with trembling hands, makes a discreet Sign of the Cross and inserts a sheet personally signed by him into an opening in the Wailing Wall. It is directed to God, to the entire world. We read with deep emotion and joy: a prayer begging pardon for the wrong done by Christianity for centuries to the People of the Covenant, the Sons of Abraham! I can hardly control my immense emotion. I know that all this must be said, but how? It is not meant to be a simple report. Millions of special reporters from the whole world will relate this in millions of their articles. Maybe I will write all this in a letter to a close friend who will be able to understand me if I am capable of putting it all into words. I fear that an ordinary voice, even the most discreet, could mar these feelings, make them foreign to me. Only silence transmits safely what is found in the deepest part of the human soul. Soon it appears that I am not the only one who needs to share these thoughts and feelings. Father Wrona calls me suddenly from the Center of Dialogue and Prayer at Auschwitz. Thanks to him, a few years ago, I learned more about the Christian traditions of my native land; my Polish compatriots became closer to me; the sense of belonging to the land of my childhood grew, even though I have not lived there for quite some time. Cordial relations with the Carmelite Sisters at Auschwitz have equally contributed to this feeling of closeness. From now on, not only my childhood and the Shoah bind me to Poland. Once more at the airport of Tel Aviv a crowd of important personages, a horde of reporters from the press of the whole world, a red carpet, an orchestra, the army, the anthems of Israel and of the Vatican, flags, friendly, cordial smiles and this time, the airplane of El Al. Warm good-byes, like those of persons very dear. They walk side by side on the red carpet, like old friends, the Pope with Prime Minister Barak on his left, on the right, President Weitzman. They whisper something, smile, mutually exchange confidences, inclining their heads toward each other, so as not to lose a single word of these last few moments, almost obscured by the roar of the motor. In an instant, the plane will take off towards the sky and will carry the Pope back to Rome. Blue and white balloons rise in the air along with so much that is new, so many hopes! When, on Friday morning at the beginning of his visit, I saw the Pope walk slowly with his cane toward the tent on the Mountain of Blessings at Korazin, among the applause and the songs of thousands of people gathered there, I had the impression that in the weakness and illness of an old man, he was advancing toward eternity. At the same time I felt that in the power of who he is, of what he has accomplished, of what he says, of what he gives of himself and of what his person represents, he goes forward with an unfaltering step into a future without the limitations of human life. A Note: the article was written By Halina Birenbaum in Polish on 27 March 2000 and published in WIEZ, May 2000.